In this Minute Clinic, we search for reasons why preventative maintenance and maintenance in general isn’t always well practiced. 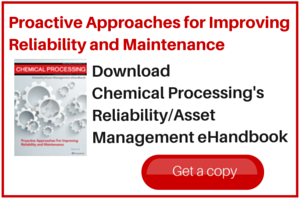 Indeed, Chemical Processing polled its audience and asked: How often does your site postpone scheduled or necessary maintenance to avoid production disruptions? Nearly 20% said frequently and over 30% said sometimes. Joining me in the clinic today is Chuck Deise. Chuck is a Senior Vice President for the Chemical Business Unit at Argo, a global operations improvement consulting company focused on asset-intensive industries. He is a seasoned veteran has more than 25 years of experience in the chemical process industries, where he has been advising and working with global clients to implement programs that transform operations and improve productivity. In this Minute Clinic, we search for the holy grail: Operational Excellence. Continuous improvement is a goal for any business. If it’s not, then troubles will begin. The purpose is to have happy customers. To attain continuous improvement you must achieve operational excellence. This applies to every level and every person in the organization, from executives all the way down to the employees. With me here today in the Clinic is Chuck Deise. Chuck is a Senior Vice President for the Chemical Business Unit at Argo, a global operations improvement consulting company focused on asset-intensive industries. . He is a seasoned veteran has more than 25 years of experience in the chemical process industries, where he has been advising and working with global clients to implement programs that transform operations and improve productivity. In today’s clinic we will learn how companies in the chemical industry can better manage changes, gain financial and organizational flexibility, improve productivity and enhance client relationships all by taking a cue from the classic schoolyard game, leap frog. Our expert in the clinic is Chuck Deise, vice president in industrial, chemical and energy for Xerox Business Services. Chuck is a key member of the leadership team and is responsible for advising strategic clients on enterprise strategies to increase sustainable business performance, digitally transform and implement next generation business processes to improve productivity and optimize operations.